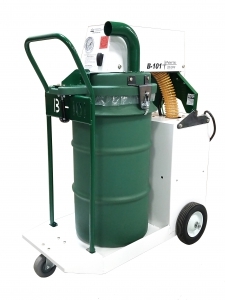 Unlike other industrial vacuums, the B-101 Pulse Vac is designed specifically for the removal of fine dust and powders without clogging. This is the only portable vacuum in the market today with a built in compressed air pulsation system that continuously cleans the filter. With a two stage vacuum motor, the B-101 Pulse Vac is one of the most powerful vacuums available that operates on 120 volts. Your reduction in filter cleaning labor combined with its adaptability to all shrouded equipment, the B-101 Pulse Vac is the most essential and recommended vacuum by contractors today. The A-404 Pulse Vac has been designed for the contractor who requires large amounts of dust containment. The A-404 has four primary filters that are pulsed clean with a reversed charge of compressed air every 6 seconds to give you continuous vacuum. The A-404 Pulse Vac has two 5” hose inlets allowing large air volume and an adapter pipe to run five 2” hoses for smaller hand tools. 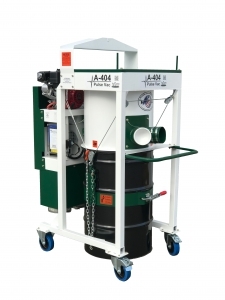 The A-404 collector can hold a full 55-gallon drum of material up to 1000 lbs. It has an easy latch down drum strap allowing you to use any 55-gallon drum. The operator has the ability to lift the collector drum with a forklift truck through the chain pivots for easy dumping. Optional motor choices of gas engine and 220V, 460V on special order. With your reduction in filter cleaning labor combined with its’ adaptability to all shrouded equipment, the A-404 Pulse Vac is the most essential and recommended dust collector system for today’s contractor.